After decades of harvest and fire suppression, many National Forest lands are densely blanketed with young trees that are vulnerable to catastrophic wildfire, insect infestation and disease. High-grade logging and clearcutting throughout the 20th century reduced much of the region’s historic old-growth forests, making the protection of those that remain a national priority and restoration a necessity. With much of the old growth gone — and, in salmon territory, fish runs dwindling as well — communities that depend on these public lands have suffered. Many rural towns have watched their local mills close up shop and local employment options disappear. These four stories record how former opponents — industry workers, environmentalists and agency officials — recognized their mutual interests in both restoring the health of the forest and building an industry to utilize the by-products of forest restoration. In their pursuit of a shared vision, they encountered challenges and created opportunities that serve as lessons and models for all of us. Enabling these efforts is the federal Stewardship Contracting Authority, a provision of the 2003 general appropriations bill. 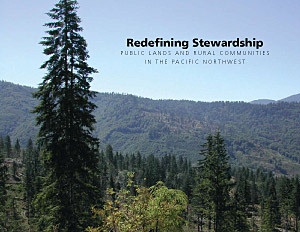 It directs the USDA Forest Service and the Bureau of Land Management (BLM) to collaborate with their neighboring landowners, interested community members and business leaders to develop forest and watershed restoration projects that meet the needs of the community, the agencies and the land. In recent years, these public-private partnerships, often called stewardship collaboratives, have gathered momentum around the region. The stakes are high. Millions of acres of crowded stands and degraded watersheds across the Pacific Northwest present a management as well as a market challenge. With these new authorities, stewardship collaboratives are forging solutions that consider both the supply and demand sides of the wood products market. In each of these four communities, a dedicated group of partners is working to gain long-term supply commitments and to spur reinvestment in local, small-diameter forest product infrastructure. Rural communities and urban centers alike benefit from the good management of forest ecosystems. With this publication, Ecotrust and Resource Innovations highlight a shared public responsibility for forest and community health. For years, our own economic development and restoration work has paralleled that of the groups profiled here. These stories celebrate the accomplishments of four communities that have created groundbreaking partnerships and have changed the tone of public-lands discussions in the Pacific Northwest. This publication was printed on New Leaf Imagination 100 paper, a 100% recycled fiber stock that is FSC-certified and manufactured entirely with renewable energy. Ecotrust saved the following resources by using this paper: 25 fully grown trees | 10,437 gallons of water | 18 million BTU energy | 1,155 pounds solid waste | 2,280 pounds greenhouse gases.